A group of Arizonans is challenging Gov. 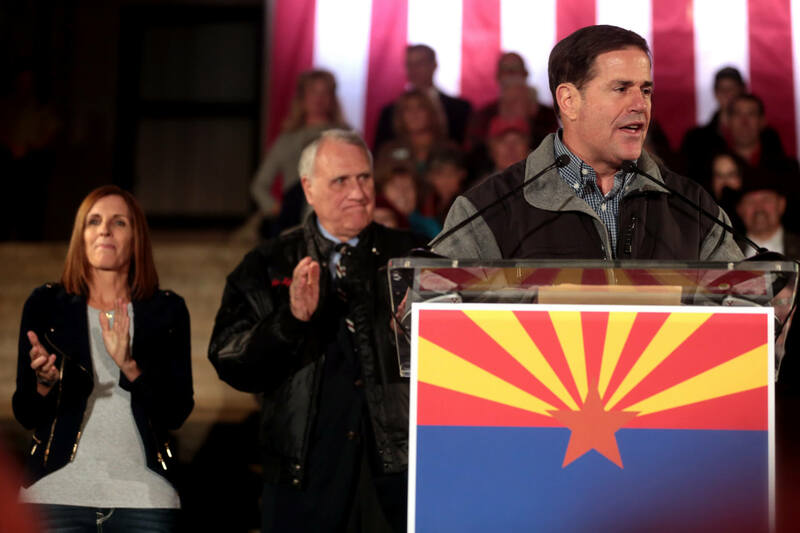 Doug Ducey’s authority to appoint U.S. Sen. John McCain’s replacement in the Senate until 2020 under a novel legal theory that it violates the Seventeenth Amendment to the U.S. Constitution, flying in the face of the way the majority of states fill vacancies. The Arizonans, represented by a public interest law firm in Chicago and a local Libertarian attorney, argued in a lawsuit filed in federal court that the Seventeenth Amendment requires Ducey to call a special election to fill the Senate seat, which became vacant upon McCain’s death in August. Ducey in September appointed former Sen. Jon Kyl, who is expected to step down by the end of the year, which would once again require Ducey to appoint a replacement. The plaintiffs are asking U.S. District Court Judge Diane Humetewa to force Ducey to issue a writ for a special election for the seat within six months. One of the plaintiffs is Barry Hess, the Libertarian Party’s four-time candidate for governor of Arizona. State law dictates that the governor appoint a temporary senator to fill any vacancy, and that a special election be held for the remainder of the term at the next regularly scheduled election. But if the vacancy occurs less than 150 days before the next election, the appointee serves until the election after that. But the lawsuit claims that Ducey’s appointment of Kyl and failure to call a special election deprived Arizonans of their constitutional right to choose their senator under the Seventeenth Amendment. “[T]he state legislature has no authority to mandate that a temporary appointee shall serve in lieu of or in preference to a Senator directly elected by the people, beyond any period necessary to hold an orderly election. The state legislature may not substitute its own choice or the Governor’s choice for a choice made by the people of the State,” the lawsuit reads. “We believe the law is constitutional, and we followed it,” Ruiz said. Arizona is one of 36 states in which governors fill Senate vacancies through appointment, with the appointee serving through the next general election, according to reports by the National Conference of State Legislatures and the Congressional Research Service. In at least six states, including Arizona, the appointee serves for more than two years if a vacancy occurs in close proximity to the next general election. The U.S. Supreme Court has never ruled definitively on the boundaries of the Seventeenth Amendment or whether it requires states to act within a certain time period, but lower courts have weighed in on the issue. In 1969, a three-judge panel in U.S. District Court in New York upheld the appointment of Charles Goodell to fill the Senate vacancy caused by Robert Kennedy’s assassination. Goodell served out the remaining 29 months of Kennedy’s term, and a special election was never held for the seat. The Supreme Court affirmed the ruling, but didn’t issue an opinion that established any precedent. More recently, the 7th U.S. District Court of Appeals ruled in 2010 that although the Seventeenth Amendment requires governors to issue a writ of election for Senate vacancies, legislatures can strictly limit the times in which governors can call special elections, including limiting special elections to a narrow range of dates or even a single day. Josh Chafetz, a constitutional law expert at Cornell Law School, said the lawsuit is a longshot. He noted that, in the more than 100 years since the Seventeenth Amendment was ratified in 1913, the Supreme Court has never used it to strike down a state’s process for filling Senate vacancies or to mandate a time limit for calling a special election. “There’s no time limitation in there. It’s just up to the legislature to decide when a special election will be held, and then a gubernatorial appointee can serve in that role until the special election,” Chafetz told the Arizona Mirror. Chafetz noted that the majority of states have similar systems in place for filling Senate vacancies. He said it’s reasonable for states to decide to wait until the next regularly scheduled election for financial and administrative reasons, as well as to ensure higher voter turnout. Michael Persoon, a Chicago-based attorney representing the plaintiffs in the case, told the Arizona Mirror that previous judicial rulings on the Seventeenth Amendment came from lower courts, not the Supreme Court. He noted that, although the Supreme Court affirmed the lower court ruling in the New York case, it was a summary affirmance that carries little precedential value. Chafetz agreed with that interpretation of the case. Persoon said two Supreme Court rulings, both of which the lawsuit cited, bolster the argument that Arizona law violates the Seventeenth Amendment and the Constitution’s Elections Clause, which grants states the authority to determine the time, manner and places of elections. In the first, a 1995 opinion that struck down a congressional term limits law in Arkansas, the Supreme Court ruled that the Elections Clause only granted states the power to issue procedural regulations, not “power to dictate electoral outcomes.” By allowing a gubernatorial appointment to serve for two years or more, Arizona law is dictating electoral outcomes and giving the appointee the advantages of incumbency.